NOTE: This is not legal advice and the information here is provided as prompters for your own content that must be written within your own context. You should confirm with your team and seek legal advice before launching a live campaign (that may be supported by an EU resident) with your data usage notices on Do Gooder. 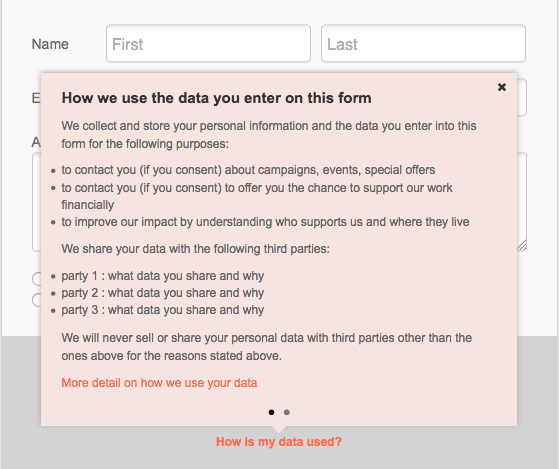 We recently added the ability to add a notice that explains how you use, store and share the data that is entered on your action forms by supporters. This notice helps supporters make informed decisions about the information they give and their choice to provide it to your organisation and Do Gooder and ensures your organisation and Do Gooder comply with the EU's GDPR laws. The key thing here is to be concise and clear and limit the information to bullets without being so general that the information doesn't convey the essence of your intended approach to managing the data your supporters share with you.